For many homeowners, lawn maintenance can seem like a daunting task. If you are one of those people then don’t worry because we are here to help. A well-maintained lawn can significantly improve your garden appeal and thus add value to your home. To ensure your lawn is blooming, we’ve compiled 2 maintenance tips to give you a beautiful lawn. Grass needs nutrients and minerals to thrive. A lot of lawns are malnourished which leaves them not looking as good as they could. Patchiness, discolouration and bare spots are signs of a lawn that isn’t thriving. These problems can be avoided with the proper addition of nutrients and minerals. Fertilizer application is very important for a beautifully green looking lawn. Without a supply of nutrients, grass will use up the nutrients in the soil resulting in a thin and pale growth. In lawn fertilizer, nitrogen is contained which contributes to the colour of grass by boosting chlorophyll production. You can apply this lawn feed by spreading it by hand or by using a push spreader. Make sure to wear protective gloves when handling lawn feed and always follow the instructions on the label. Lawns should also be watered regularly. Heat can leave your grass brown and brittle which is not a good look for any area of grass. How much you should water depends on how much grass you have. Regular lawn mowing with a quality lawnmower will have your lawn looking incredible. Most lawns should be cut every week depending on how often it’s raining and the time of the year. It is best to cut your lawn regularly during the spring, summer and autumn months. When you are cutting your lawn you don’t want to cut it too short, around 2 to 4 inches high is an ideal height. A very short height can leave brown or bare-looking spots in the lawn. If you cut your grass very short you leave your lawn vulnerable to pests and weed invasion. A lawnmower with a quality sharp blade will cut grass cleanly and evenly. 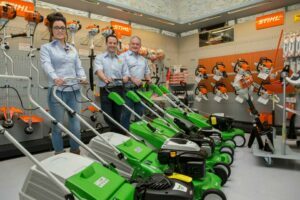 A quality lawn mower is certainly a machine you’ll want to make an investment in. The quality of the lawnmower will have an impact on the quality of the cut. The type of lawnmower you own should depend on the size of your garden lawn. Smaller sized lawns would be fine with a less powerful lawn mower or a battery powered lawnmower, medium sized lawns would need a relatively powerful walk-behind lawnmower while with very large lawns, a tractor mower would be suitable to make the job easier. Taking care of your lawn does not have to be difficult. By keeping up with regular maintenance, investing in quality lawn tools and listening to the above tips, you will ensure the best possible results for your home garden. Visit us online today to see our fantastic online store. BERG trampolines are top quality trampolines and provide a great source of entertainment for children. A BERG trampoline looks amazing by itself but you can make your trampoline look even better by adding accessories to it. All BERG Trampolines accessories are produced from high-quality materials and manufacturing processes. 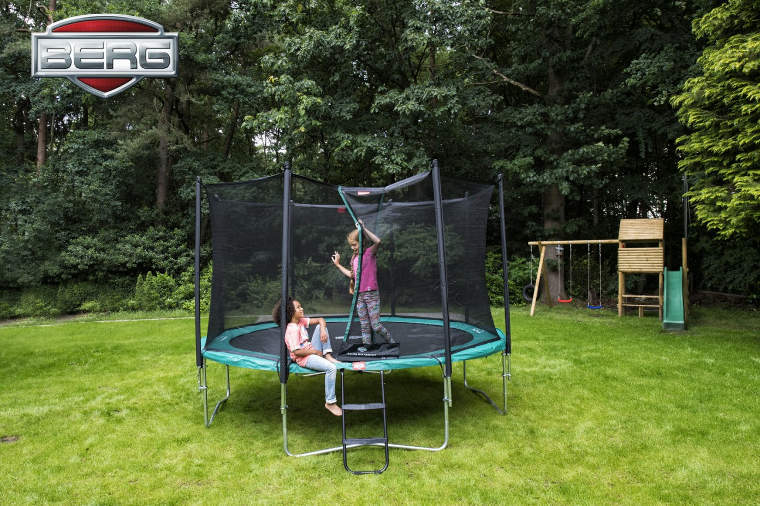 Due to the use of high-quality materials by BERG, these accessories last for a long period of time so that people can enjoy them and their trampolines for a long time. There is a huge range of trampoline accessories available to give your trampoline that personalised touch. From covers to frame nets to ladders/platforms to anchor sets we have all the products you need to add to your trampoline. Frame nets are designed so no one or nothing can accidentally get under your trampoline. When someone is jumping on the trampoline, this could be very dangerous. This applies to children, animals or large toys. Frame nets are for optional safety when jumping we sell frame nets for 6ft, 8ft, 9ft, 10ft,11ft, 12.5ft and 14ft trampolines. An anchor set ensures that the trampoline stays solidly on the ground, even in extreme weather conditions. This means that you are eliminating the chances of your trampoline falling over and causing a serious accident.